Can a woman really become the president of Russia and where can a child study to become the head of state, does he like porridge and when will we see the new first lady - the Russian President wrapped up his 14th Q&A session after talking to his country for three hours and 40 minutes. Vladimir Putin's Q&A session in 2015 was watched by 8.4 million people and lasted 3 hours and 57 minutes. The Russian leader answered 74 questions out of over 3 million submitted by members of the public. After three hours and 40 minutes the President wraps up his 14th Direct Line. If they've really had 3 million calls, that means one in 50 out of Russia's entire population trying to get through to Putin. — Shaun Walker (@shaunwalker7) 14 апреля 2016 г. "This is another proof that the President is a decent guy. It takes heart to admit something like that" - in response to President Obama admitting his mistakes in Libya. The President said that when Obama was a senator he used to criticize the gov't for Iraq, then when he became the President he made the same mistakes in Libya. It is good to own up to your mistakes but the bad thing is that the string of mistakes continues. "The US wanted to follow the same course in Syria. But we managed to work this out with the US to avoid this through working hand in hand to foster a solution," he said. Alena, a 1st year school pupil asked if it was possible for a woman to become a President in Russia? The girl asked whether a woman could become the president of Russia? "Because daddy says only Putin can handle those Americans". "America is not our only problem, we have issues to deal with at home to make us strong," the President responded. We need to focus on our own issues, then we won't need to 'handle' anyone. "A woman may be able to handle these issues better than a man!" he then concluded. Now, attention moves to Tula, the arms production capital of Russia. An employee of an arms factory asked how Russia can capitalize commercially on the success of the military operation in Syria. The president said that this is happening. More factories are being built to develop air-defense systems. — Alexey Khlebnikov (@AleksKhlebnikov) 14 апреля 2016 г. ​The president said that the interest towards Russia arms have increased after the success of Russia's campaign in Syria. However, not everything was perfect, the President noted. There were some flaws noticed and specialists flew in to Syria to make adjustments. Putin said that, "Government defense contracts will not be reduced." Putin said that the defense budget will be optimized, and the defense industry must think about this too. The equipment purchased by arms manufacturers should also be capable of producing civilian equipment. In the wake of the recent terrorist attacks in Europe, the President said that European students are safer in Russia. Answering a question can we make it easier for foreign students and teachers to visit Russia, the President said, stressing that his answer was without sarcasm, that in the wake of the recent terrorist attacks in Europe, the European students are safer in Russia, because Russia's anti-terror measures are a lot stronger than those of Europe. — Anna Shamanska (@_shamanska) 14 апреля 2016 г. — Maria Finoshina (@MFinoshina_RT) 14 апреля 2016 г. The President comments on the reforms of Russian Academy of Sciences. On the settlement of Nagorno-Karabakh conflict. Russia is interested in resolving the issue, no matter what people say, the President said. "We will look for a political compromise. I thought we were close a few years ago, but unfortunately I was wrong." — Murad Gazdiev (@MuradoRT) 14 апреля 2016 г. What urged the President to create the National Guard. The president said that the issue was discussed for a long time. The main reason was for managing gun control. It will save lots of money. "We need the police to monitor migrant flows especially given the current situation." In a sweeping reorganization of Russia's internal security apparatus, President Vladimir Putin has announced the creation of the National Guard – a powerful new paramilitary unit charged with combating terrorism and organized crime and maintaining social order. Why did the president decide to create the new unit now? Sputnik investigates. In response to the new Ukrainian Prime Minister and the new government. "I have no opinion on the new Ukrainian gov't because I know nothing about them." "The nine point plan that the previous cabinet adopted – only two points have been completed. The results of this are painful," he added. "We are interested in Ukraine getting back on its feet and being a strong partner." On the implementation of the Minsk accords. The President said that many elements are stalling. The most important issues are political, that the people living in Eastern Ukraine have their rights assured that there is political reform. #Putin said #Russia is not against #Ukraine's call for a bigger, armed #OSCE monitoring mission at line of contact in #Donetsk/#Luhansk. — Dan McLaughlin (@DanMcL99) 14 апреля 2016 г. ​Kiev must pass some reforms which we cannot influence. The Ukrainian president has not signed all the reforms. 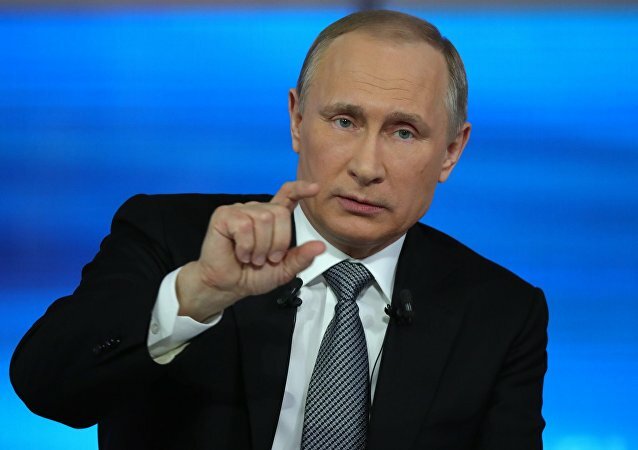 Putin said that it is easy to influence the ceasefire to ensure the Minsk agreements are delayed. On a possible introduction of a common currency within the Eurasian Economic Union. The President responded that an introduction of a single currency is possible but only when all the member states of the Union reach the same economic level. Russian President Vladimir Putin said that a single currency for the Eurasian Economic Union could be introduced only when the levels of economic development and the economic structures of the EEC member states even out. The Russian President is answering a question from the country's business community and their inspection checks. Most businesses say that they are inspected up to four times a year. The inspections are punitive. They keep "milking" businessmen. "So, when will the gov't start treating businesses like partners?" asks the audience member. The president said that a new law meant that every inspection has to be agreed with the attorney's office, and inspections have fallen by a third. Putin said that the gov't will continue to listen to the concerns of business. Putin answers questions about the distribution of medical equipment to children and the universal rights of visitors to see patients in intensive care. In response to a question about the sanctions imposed on Russia, the President said that he doubts that Russia's Western partners will lift them any time soon. A question was asked on the removal of the food embargo, and how it will have a negative effect on farmers who have invested in import substitution. The president said that he doesn't expect the West to lift its anti-Russian sanctions any time soon, even though Minsk agreements are being implemented. They will find other reasons to keep their restrictions in place. Given events in #Ukraine, #Putin says he does not expect West or Russia sanctions to end any time soon. — Neil MacFarquhar (@NeilMacFarquhar) 14 апреля 2016 г. A number of calls were about the upcoming parliamentary elections. A phone caller asked if voting make a difference if votes will be calculated in favor of the United Russia Party? The President said that while United Russia is a stabilizing element in Russia, it is not favored. Their candidates do lose elections. People voting responsibly will ensure that the candidates elected are the ones that the country needs. He encouraged all Russians to cast their votes. — Russia Direct (@Russia_Direct) 14 апреля 2016 г. ​And added that he hopes that the candidates elected will realize their responsibility. The existence of a set of political parties in power, which remains virtually unchanged in many developed countries, is a case of "leapfrog," which may be dangerous, Russian President Vladimir Putin said. "In countries that lay claims to be called 'countries of developed democracy' a very similar thing happens [to what happens in Russia] - leapfrog, it may even be dangerous," Putin said during his annual Q&A session. The president used the bipartisan system in the United States and the traditional rivalry between conservatives and socialists in France as examples. In two hours of the Direct Line, over three million calls were registered at the call center. To a question: who is worse for Russsia - Trump of Clinton, the President responded that we should be looking for those who are better, not worse. The President was asked a question about who is worse for Russia - Trump or Clinton? The Russian leader responded that international relations should be about cooperation, and not the lesser evil. "You know, we should be looking for someone who's better, not worse," he said. Asked about the so-called Panama Papers, Putin said the information was legitimate, but instead of accusations, were full of insinuations. — Alexander Frost (@AlexB_Frost) 14 апреля 2016 г. The closer we are to elections, the more publications like this we will see, the President noted. "The country that refuses to toe the line will always be targeted in this way." ​The President said that he thought we had moved on from this. This was prepared by lawyers rather than journalists. It was all about "hints and speculation". “Figures who created Panama Papers poked around in the dark, or perhaps poked in other places,” the President said. Putin hints U.S. behind Panama Papers, citing Goldman Sachs' stake in Sueddeutscher Zeitung. Says "attacks" to get worse ahead of elex. — James Marson (@marson_jr) 14 апреля 2016 г. President Putin fields questions from employees at a fish factory. One employee asks a question about corruption amongst local officials and businessmen. The president said that he cannot speculate on individual cases, but that the gov't will not step away from prosecuting guilty officials. They will have their property confiscated and money will be returned to the state. Contestants from the Island of Sakhalin participating in the second All-Russian festival and contest of tourist videos 'Miracle of Russia', taking place earlier this year in Moscow, offered a worthy entry, featuring visually rich footage of the island, located in the Russian Far East and situated in the North Pacific Ocean. A 9-year-old girl asked: do you eat porridge for breakfast? Did anyone make you eat porridge you didn't like? "No one has told me what to do. Yes, I eat porridge every day! I like it even more than I used to,'" the President responded. "The less teeth you have, the more you like porridge!" #Putin "Nobody ever forced me to do anything I don't want to do and I actually like porridge"
— Wednesday Atoms (@genericpanic) 14 апреля 2016 г. To a question from 11-year-old Angela: If a genie gave you three wishes, what would you choose? "We shouldn't rely on miracles. We have to work with our own hands," the president answered. "Otherwise we will end up with nothing, just like in a famous Pushkin fairy tale." #Putin's three magic wishes? "Putin: The best things do not come from fairy tale characters. You have to get it yourself"
— Damien Sharkov (@DamienSharkov) 14 апреля 2016 г. What would #Putin's wishes from the goldfish be? Answer: better to do everything with our own hands. — András Tóth-Czifra (@NoYardstick) 14 апреля 2016 г. The president is answering the questions on social infrastructure, social welfare benefits and previous economic crises in the country. An entrepreneur in the audience thanked the president for his work on behalf of his wife. The president in return gave his thanks for evaluation of his work. 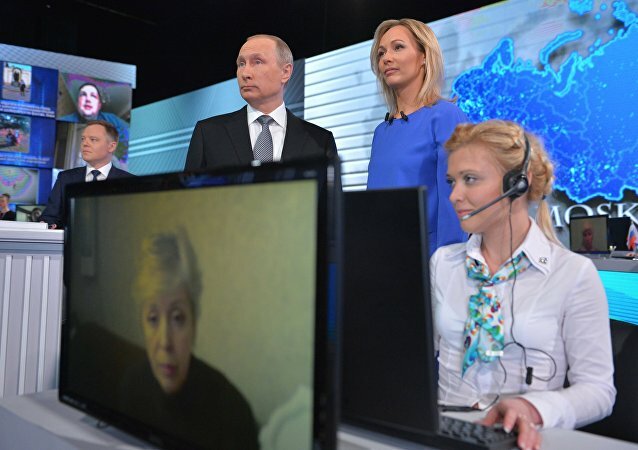 Businessman at #Putin's call-in show: "My wife Tatyana asked me to thank you for your work." — Birgit Schmeitzner (@BSchmeitzner) 14 апреля 2016 г. ​The president discusses the disparity between property tax and the real property prices. On the doping scandal: should Russian athletes prepare for the Olympics given the recent events? The President said that athletes should be prepared at all times. Russia is working with WADA and international lawyers to clear the situation up. Personal question from a pensioner on President Putin's private life: when will we see the new first lady? The question was: the ex-Mrs Putin has remarried, when will you introduce your new lady to us? — Alec Luhn (@ASLuhn) 14 апреля 2016 г. ​"I have a very good relationship with Ludmilla, maybe better than before!" the President joked. "I'm not sure if I should advertise my personal situation, it may change the currency or oil price!" "I'm aware people want to know about my personal life but it's not really important. I may satisfy your curiosity in the future." On security for Russian tourists in Turkey: President Putin doubts the ability of the Turkish leadership. When asked how save it is for the Russian tourists to travel to Turkey ahead of the start of the summer season, the President said that he is sure that the Turkish leadership will try to provide security for tourists, but he is unsure of its ability. On the energy bridge construction to Crimea: we are now approaching the amount of power we used to receive from Ukraine. Workers have erected the first pillar of the Crimea bridge's highway which will connect the peninsula's town of Kerch with Krasnodar Territory in mainland Russia. A question from 12-year-old Vera: whom would you save Poroshenko or Erdogan, if they were both drowning? The president joked that the question caught him off-guard. However he further explained that If someone decided to drown, there's no saving them. But "we will lend a helping hand to anyone who asks." — Luke Allnutt (@lukeallnutt) 14 апреля 2016 г. A question about Turkish President Erdogan and Russia's relationship with its neighbors. President Putin explains that Russia has mostly friendly relations with its neighbors, however it has problems with some of the leaders. Russia will pursue good relations with all its neighbors. President Putin is answering a question on pharmaceuticals; it is one of 400,000 text messages received by the leader. When asked what medicines he prefers, Russian or imported, the President answered that he tries not to take medicines, he just does sports. -Do you use imported or Russian medicines?#Putin: I try not to take medicines, I just do sports. — Yulia Bragina (@YuliaSkyNews) 14 апреля 2016 г. On strategic importance of Aleppo. The president also touched upon the situation in Aleppo, which he called a strategic city. There are many terrorist groups there. It is difficult to tell them apart, he admitted. The Syrian army has a good position there. The opposition wants to retake positions there. It is Kurdish and militants fighting there between themselves. On Russia's foreign policy and Syrian campaign. The Russian leader is explaining the partial withdrawal of Russian air force from Syria. He said that the threat of terrorism is still there, but Russia has not abandoned Syria, it have left the army in a strong position. They have taken some key strategic cities. The president hopes that a political process will solve the situation, not force. "The threat of terrorism is still exists, and while we have withdrawn from Syria but we have not abandoned the country. We have left the army in a strong position," said the Russian leader. According to the Russian President, terrorism still remains a threat. Russian economy is now in the middle ground between good and bad. Overall the situation has improved and the trend is positive. A question about whether the economic decline has bottomed out. "We have a positive trend but it is not over. We expect GDP to continue to fall 0.3% this year, and next year we will see growth," said the president. The president explained that it's not about printing money, Gov't must restructure the economy. Industrial production increased in Feb. High tech exports are increasing compared to commodity exports. — Sarah Rainsford (@sarahrainsford) 14 апреля 2016 г.
Vladimir Putin said that Russian economy is currently in a grey area and there has been no improvement, yet the trend is positive. 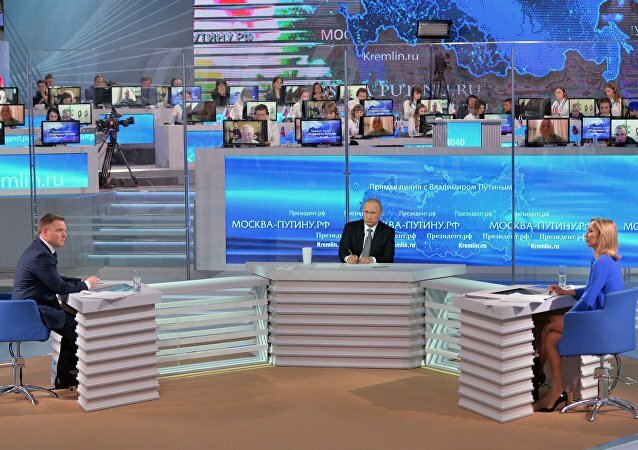 Russian President Vladimir Putin's 14th Q&A session is set to start at 9 a.m. GMT (12:00 MSK) Thursday. Russian President Vladimir Putin will hold his annual Q&A session on April 14. It will be broadcasted by the country’s major TV channels and radio stations. The first question comes from the city of Omsk about the road infrastructure. A lady asks President Putin about the poor quality of the roads in the city. ​In addition to phone lines, Russian citizens are now able to send text messages, record brief video questions, and submit questions online via websites or smartphone apps throughout the week in the run-up to Thursday. Live video call-ins are available for the first time this year as well. Russian citizens are now able to record brief video questions, submit questions online via websites or smartphone apps. Almost 1,5 million calls have already been collected. 400 000 text messages and 300 000 questions have been registered. One of the major points of interest is whether this Q&A will beat his marathon session from 2013 – where he answered 85 questions, taking 4 hours 47 minutes in the process! President Putin is answering a question about inflation. On price rises, prices have gone up at least twice, but the government says inflation is on 12%? The gov't talks about average inflation over the year. It is 12.9%. Food prices are a major factor.